This show is ridiculous. It has a Titian. It has the Kimbell Art Museum’s James Ensor painting of skeletons warming themselves by a fire. Is it a museum show? Are we shopping? 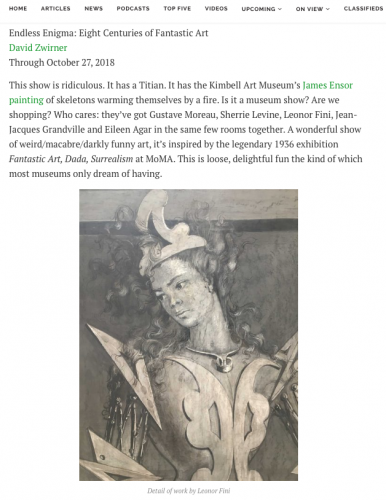 Who cares: they’ve got Gustave Moreau, Sherrie Levine, Leonor Fini, Jean-Jacques Grandville and Eileen Agar in the same few rooms together. A wonderful show of weird/macabre/darkly funny art, it’s inspired by the legendary 1936 exhibition Fantastic Art, Dada, Surrealism at MoMA. This is loose, delightful fun the kind of which most museums only dream of having.